Last Monday, we had a fun situation. This Monday, we’ve got even more excitement on tap. Dava-Leigh is looking to add to her $1,500 in winnings, which she took home to cap off a particularly bad week. It wasn’t the worst ever, though – that’s the subject of the latest By the Numbers. Raise your hand if you recognized what’s happening. Good! You all get gold stars. Not sure what you should be looking for here? Don’t worry – we’ll break it down, as always. If Dava-Leigh doubles her score, she’ll have 11,600. 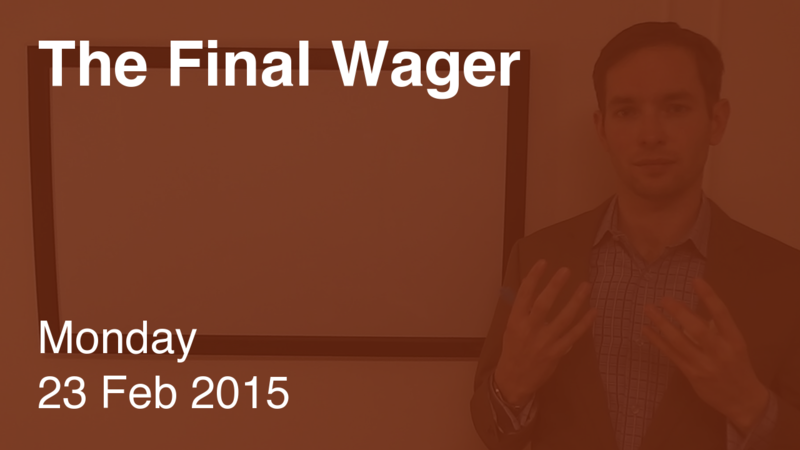 To cover this all-in wager, Britt will need to wager 1,600. An incorrect response with that wager will leave Britt with 8,400. Both Dava-Leigh and Gemma need to get it right to have a chance, so they should wager everything. Should Britt add the extra dollar or not? I discuss this in a special video. Here, as with most situations, I would add the extra dollar. The category is too vague to assess any player’s strength or weakness. 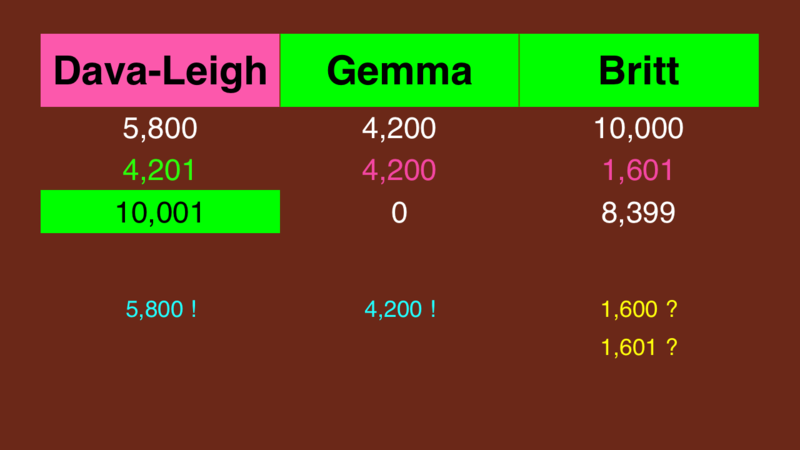 Since there is a correlation between correct answers, it’s likely that if Dava-Leigh gets it right, Britt will, too, so he’ll win by a dollar; and if Britt misses, Gemma will, too, so the extra dollar will be moot. I have to give a shout-out to Bill Tolany, who was the first in the Final Wager era to recognize this situation. Dava-Leigh gets pink instead of yellow because there’s a possibility Britt will offer the tie. In any event, she left $1,599 in Sony’s pocket. Another justification in adding the dollar is that of the eight possible outcomes there are two that favor the dollar (RRR and RRW) but only one that favors the tie (WWR). The clue was a slam dunk, I believe the other contestants answered incorrectly is because they did not study entertainment or sports and they studied history and geography etc.